There is a very famous proverb: Everyone wants to go to heaven but no one wants to die. This is one amazing fact which we, as humans cannot deny. Truth be told, in today’s fast-paced life it has become quite difficult to take out time for God, leave alone for yourself. Due to this monotonous lifestyle, many people are losing their enthusiasm to lead a very happy and satisfied life. So, here are some of the thought-provoking questions which will ignite a ray of hope in your tiresome lives. 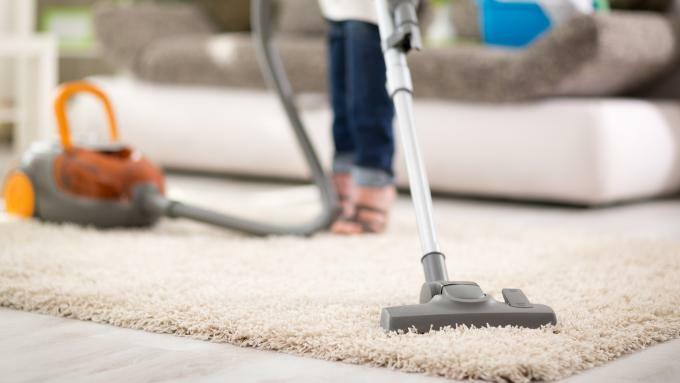 Have you got bored from your hectic day to day life? Is your conscience wanting inner peace? If your answers to the above questions are yes, nothing will give you more peace than visiting the best religious architecture ,Lord Buddha’s temple. Harmonious environment over there will make you feel relaxed and you will reach a calm state which will make your day the best. In the forthcoming sections of this write-up, we have provided valuable insights pertaining to some of the best Buddhist temple architecture designs. We promise after reading this write-up, you will get adequate information about Buddhist temple architecture designs which will definitely leave you speechless. But, before we look at them it is important to look at the history of Buddhism, one of the oldest religions in the world. Buddhism is actively practiced in lots of different countries. The sole principle of this religion relies on the teachings of Siddhartha Gautama, popularly known as Lord Buddha today. Did you know? Lord Buddha attained enlightenment in the 5th Century AD. The teachings of Buddhism are known to teach ways to end suffering. It has spread globally since its founding. But, if you think that Buddhism’s influence is limited to influencing the belief system of millions of people throughout history, you are in for a shock. It has also played a major role in inspiring some of the most fascinating landmarks in the world. The amazing thing is that Buddhist temples are not only popular in India, but also in countries like Korea, Nepal, and Thailand. Point to note: These Buddhist temples are artistic by nature. Add to this, these temples are manufactured in different patterns and styles. 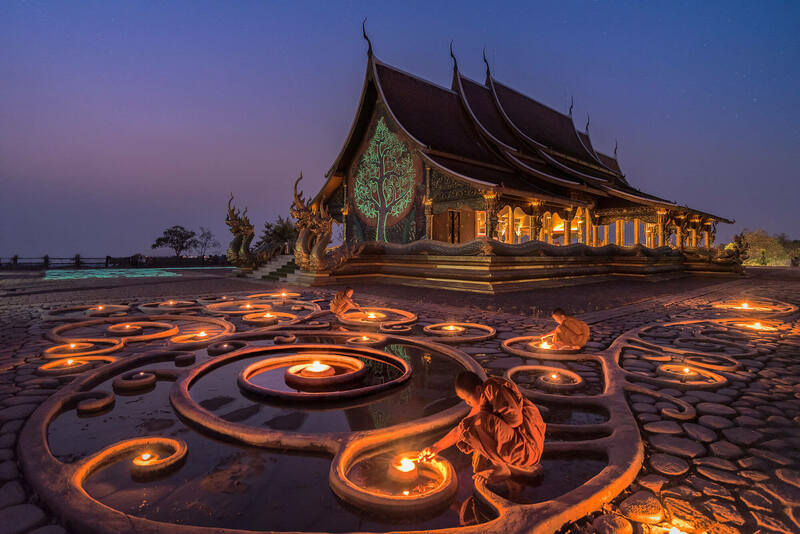 Now that you have got a fair idea about the history of Buddhism as a global religion as promised it is time to look at the some of the best Buddhist temple architecture designs that will leave you speechless. 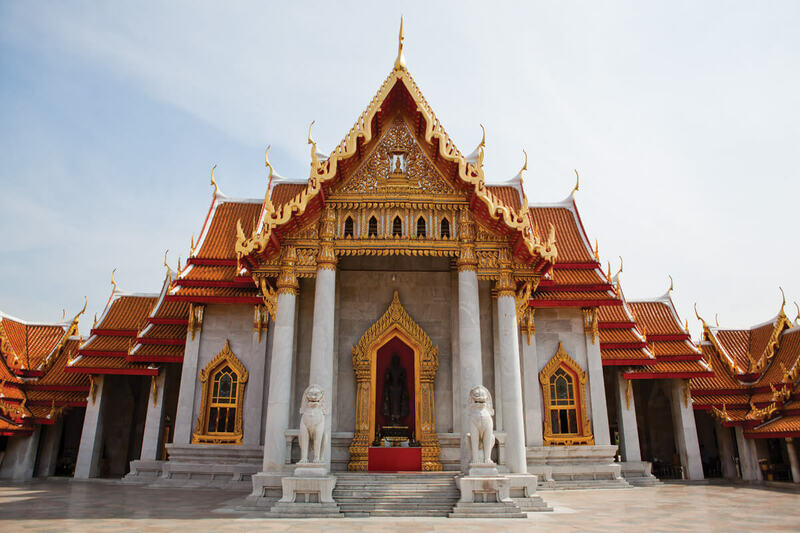 Wat Benchamabophit Dusitvanaram which is popularly known as the Marble Temple is one of the most alluring temples in Bangkok. It has garnered lots of positive reviews, thanks to its conventional Thai symmetrical architecture. Not to forget the long drawn influences of European and Chinese design. Did you know? There are only ten temples in Thailand with this specialty. Although the temple is not heavily promoted as a tourist destination like Wat Pho and the Grand Palace, it is still one of the best ones in the country. When you peep inside the Buddhist temple to orientation hall, also known as Ubosoth, it is possible to see a Buddha statue which has been designed in the Sukhothai style. You can see the ashes of King Chulalongkorn (Rama V) tucked underneath this statue. 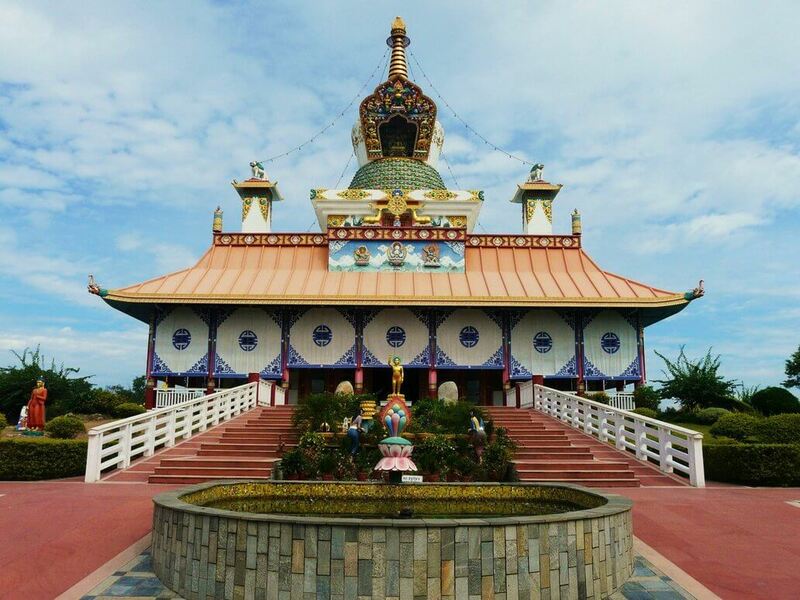 It is one of the best Buddhist temples in the country. In fact, you will be surprised to know that the temple complex was featured in the 9th season of the popular TV series titled “The Amazing Race”. It was even submitted to UNESCO in the year 2005 for the consideration as a future World Heritage Site. This Buddhist temple architecture design has been envisaged by Miliy Design studio for a location in the Chinese city of Taichang. It is based on the concept of rebirth. Did you know? The soul of Buddhism’s sutra is often called as “formlessness”. Based on the architecture design, the form searching of the architecture becomes the pavement from the start to the end. It has been established that the prototype of Buddhism’s temple is from the historical past. In fact, it is based on the contemporary tectonic and space defining logic. A mobile ring has been employed as a sign for reincarnation in this design. The added advantage is that the inner surface and outer surface circumspect at the same point in a seamless fashion. The amazing part is that the entire process is similar to the reincarnation process as depicted in Buddhism religion. You can see movement from outside to inside similar to the reincarnation of different life forms. New Nan Tien Institute and Buddhist Temple in New South Wales, Australia is one of the visual treats when it comes to terracotta material innovation. 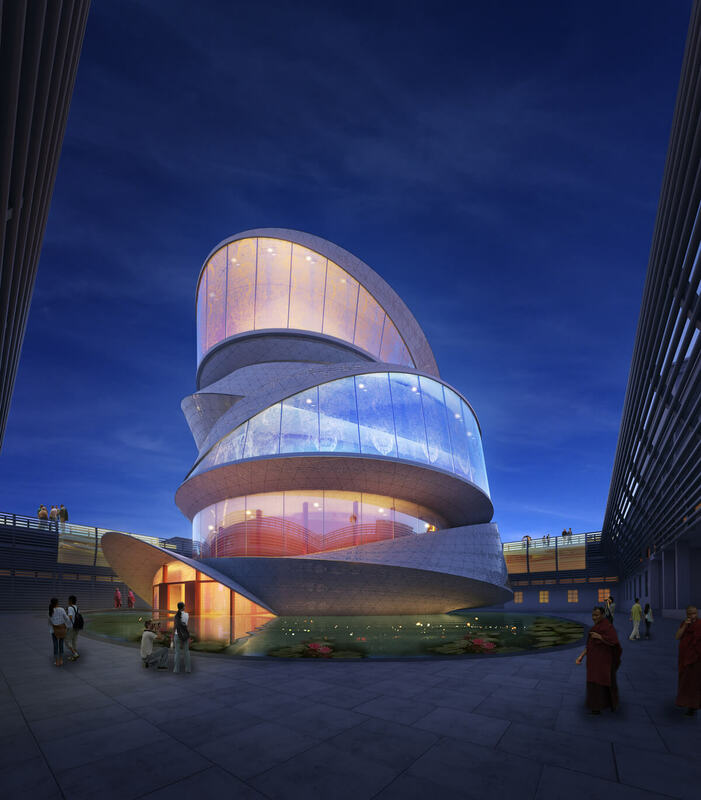 This Buddhist temple’s architecture design has been inspired by the Buddhist symbol of the lotus flower. Global design studio Woods Bagot Axoloti and specialist builders Hi-Tec developed a facade of terracotta blades that use very traditional material in a very unique way. In order to produce the effect of terracotta blades, the team employed a 0.5mm thick terracotta coating that can be mixed with a wide array of building materials. The onus for the architectural design should go to Axolotl. An amazing part: The coating is light-toned, uncomplicated, and much more reasonably priced compared to traditional terracotta. 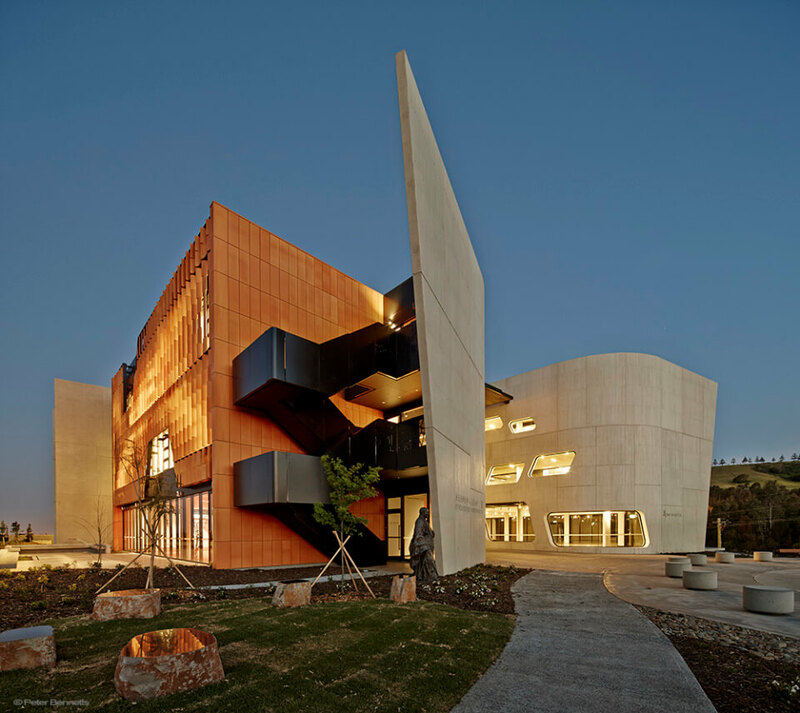 As far as the facade of the Nan Tien Institute is concerned, aluminum blades were selected as the substrate for the coating. 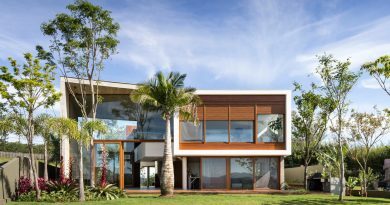 Every blade in this architectural design is attached around an axis and fixed in a place. This feat was impossible to achieve without the help of a standard terracotta. One peculiar thing about this architecture design: The terracotta-coated blades delicately move in a direction. This ultimately adds up to become a strong textural component to the building. While viewing the architectural design from a distance, it seems that the blades have become a contemporary lotus leaf. Isn’t that beautiful? 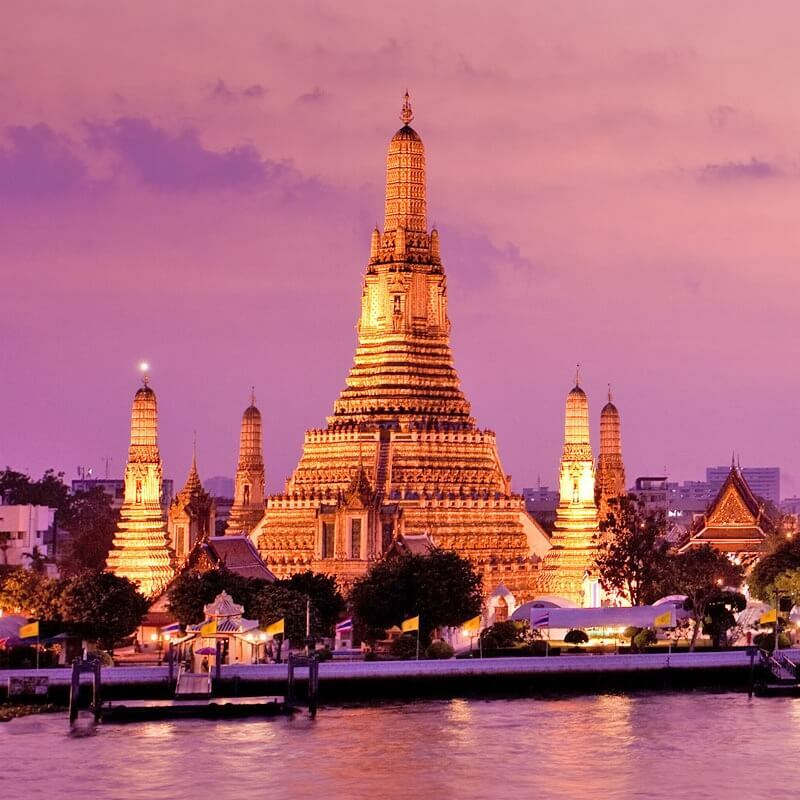 Wat Arun, popularly known as the Temple of the Dawn is situated on the banks of the Chao Phraya River. It is a Khmer-style temple consisting of four prangs (popularly known as Prasat). Did you know? There is a larger prang which is situated in the middle of the Buddhist temple. The layout of the Buddhist temple has been formulated in such a way that it represents the five sacred mountains which were home to the Gods. The central prang in the Buddhist temple represents Mount Meru which is considered to be the center of the universe. An amazing fact of this Buddhist temple is the fact that when the height of the central prang was extended, King Rama III instructed that the colorful ceramics and porcelain should be employed to develop extravagant motifs and designs. Due to this peculiar design, the prangs look glittery and shine in the sunlight. This ultimately results in giving an exclusive appeal to the temple. 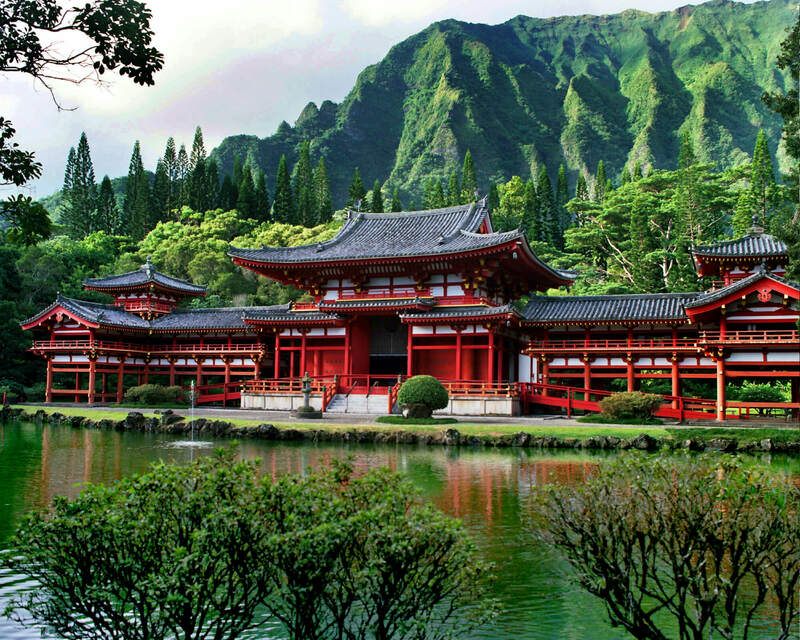 Byodo-In Temple situated on the island of O’ahu provides one of the picture-perfect scenery to stunning landscapes along the way. The best part? You get to see a 9-foot golden Buddha statue seated on a lotus leaf. A Japanese sculptor Masuzo Inui created this sculpture which is considered to be one of the largest carved Buddha outside Japan. You can literally feel the presence of this carved Buddha in the temple. On top of this, you will even get to see a zen garden, a “Bon-Sho” or Sacred Bell, and a meditation pavilion. It is believed that ringing the bell by employing a wood log cleanses the mind. 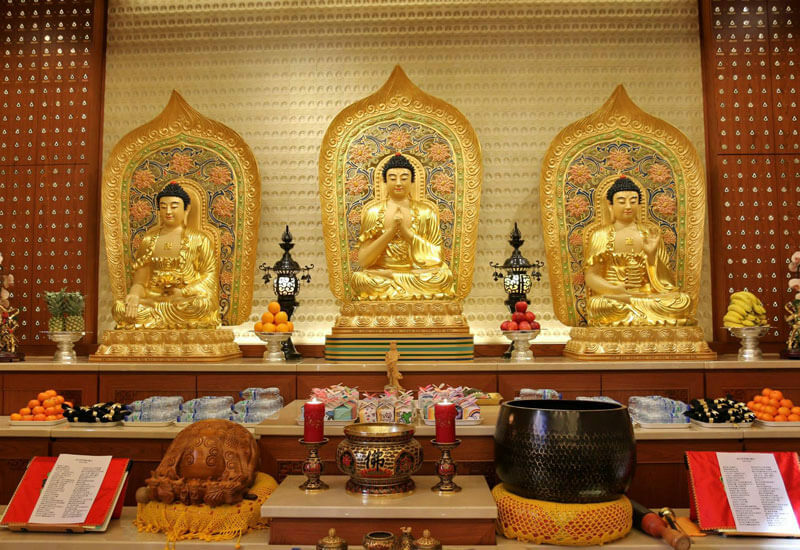 London Fo Guang Shan Temple is a fascinating Buddhist worship and training center. This temple has been listed as a Grade II building. It is situated in the middle of the London city. The amazing part? This Buddhist Temple has set a very high benchmark in terms of architectural design. Did you know? This temple can be reached within minutes from the Oxford street. The temple spans four floors. Not to forget, it even consists of a meditation hall, a library, and a refectory. The “White Temple” consists of restroom building which is made up of exclusive color. 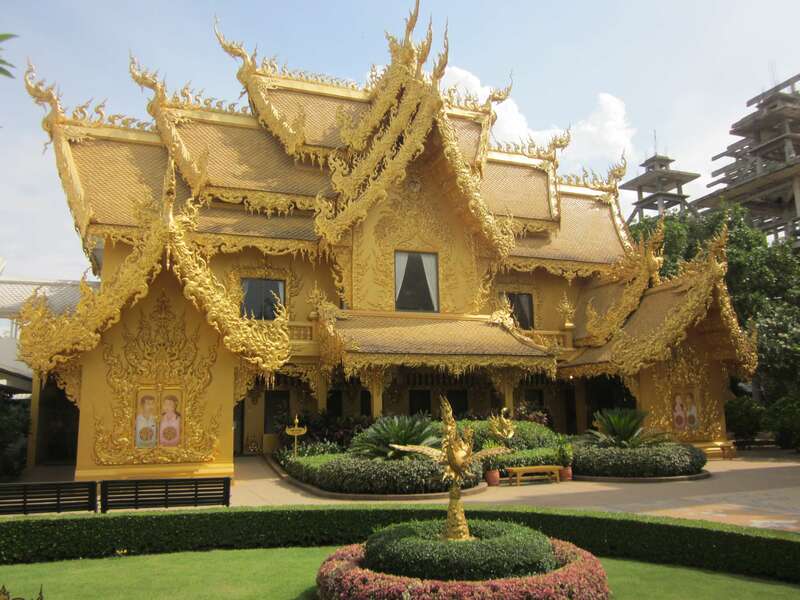 It is known as the golden building which possesses one of the best-decorated structures. There is also a white ubosot that constitutes the mind. The gold in the design represents the worldly desires and money matters focused by people. The entire crux of this building is to make people concentrate on their mind and inculcate good thoughts instead of possessions and material things. Lumbini Monastic Site is a hub of different types of temples and monasteries. It gives a unique perspective to Buddhism as a religion, its propagation, evolution, and the system of belief that assist you to learn more about spreading positivity across the globe. An added advantage: The Monastic Site is bifurcated into two parts by a water canal. Tourists explore the water canal with the help of motor boats. One of the segments is called as the East Monastic Zone. This is the place where Theravada Buddhism is practiced. The other section is called as the West Monastic Zone where Vajrayana and Mahayana are practised. Sirindhorn Wararam Phu Prao Temple also known as Wat Phu Prao is one of the most beautiful Buddhist temples that you will ever see in Myanmar. It boasts of a main hall that is made up of excellent artwork. The beautiful part is that it is illuminated at dusk. It consists of a ceramic tiles wall that provides a great look and feel during daylight. It also even more alluring when brightened. Wewurukannala Raja Maha Vihara Temple is one of the most alluring Buddhist temples situated in Dikwella, Sri Lanka. You can see the seated image of Buddha at the first glimpse. Did you know? This Buddha statue is 160 feet high. 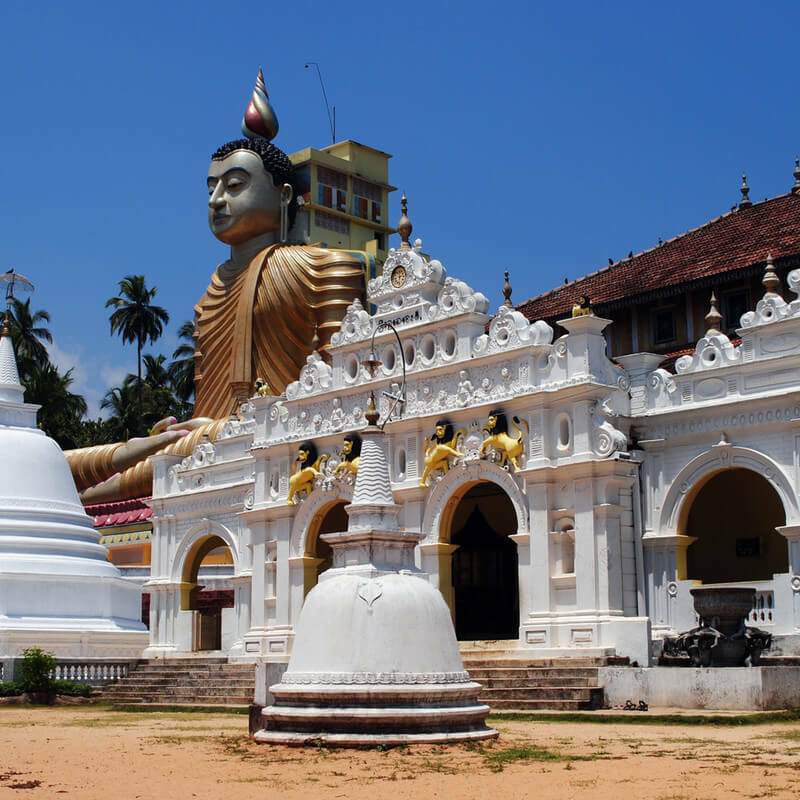 It is considered to be one of the largest statues in Sri Lanka. There is a historic prominence attached to this temple. This temple comprises of three parts. The oldest part is dated way back approximately 250 years from the present. There are also parts which symbolize large sized models of demons and sinners in graphic detail. The major purpose of the graphic representation is to provide you with the glimpse of the punishments that you might receive if you do not follow the path of enlightenment. Hope this write-up gives you a unique perspective about architectural designs of Buddhist temples. Stay hooked to get more information pertaining to such design write-ups!